This is a new way to explore overall (individual, group, community, or regional) changes that have taken place since participating in the Extension program. The Ripple Effects Evaluation process is an effective and engaging way to get information out of a person’s brain and on to paper in a visual way.This brochure demonstrates how to use mind-mapping to draw the stories and ripple eff ects of a complex program and code it to measure outcomes. Using the Community Capitals Framework, you can trace the impacts of investments in one or more of the Capitals and then make strategic alliances by understanding links of organizations to different capitals.Successful communities pay attention to each of the seven capitals: social, cultural, human, political, natural, built, and financial. 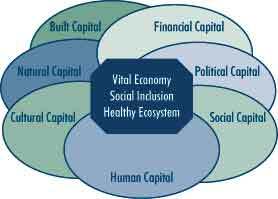 The Community Capitals Framework is to conceptualize a community system in a way that leads to effective community and economic decision-making and sustainable development. Download a description and examples of the Community Capital Framework for REMso you can think about how to strengthen them in your community.